Plant tissues. Meristem, vascular cambium. Atlas of plant and animal tissues. The image is from sunflower stem. Put the cursor over the sunflower to see where the image come from. Technique: paraffin section stained with safranin / alcian blue. Cells of the vascular cambium divide in a plane parallel to the longitudinal axis of the shoot and perpendicular to the shoot surface. It is known as periclinal or tangential division (see figure). This pattern of cell division is mostly responsible for the growing in thickness of stems and roots. 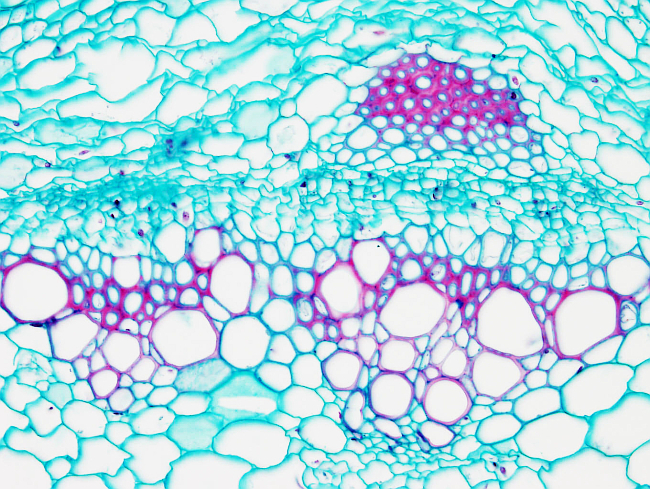 The vascular cambium produces secondary xylem inward and secondary phloem outward. It is compose of two cell types: fusiform initial cells, which are several times longer than wide and arranged vertically, and ray (radial) initial cells, which are slightly elongated or nearly isodiametric and arranged horizontally. Fusiform cells give rise to all cell types of both secondary xylem and secondary phloem, that are sorted vertically, i.e. the axial system, whereas ray initial cells give rise to the radial system. Radial system cells are involved in conduction and storing substances. 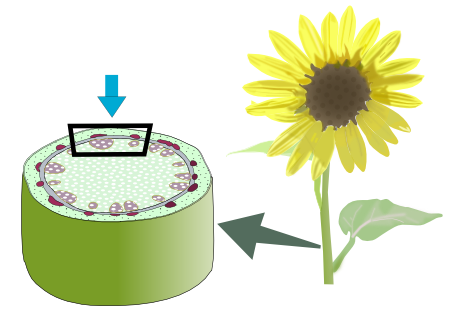 The vascular cambium produces more xylem than phloem because the xylem progenitor cells periclinally divide more times. During the first year of the plant, vascular cambium develops from the procambial cells. Procambium differentiates into fascicular cambium, located between the primary xylem and the primary phloem of individual vascular bundles. Interfascicular cambium differentiates from parenchyma or collenchyma cells located between the vascular bundles (mainly in stem). The connection of these two meristems gives to vascular cambium, which forms a continuous cylindrical sheat in both, stems and roots. In mature organs, the fascicular cambium cannot be distinguished from the interfascicular one. Sometimes, vascular cambium may remain restricted to strands or discontinuous strips. In monocots, interfascicular cambium is not formed.